I’d be remiss to not include Pfeffernüsse, a classic German spiced cookie, in our “12 Days of Christmas Cookies” series. These delicious yuletide cookies (also known as pfeffernuesse, pfeffernussen, peppernoder, or peppernuts in English) are loaded with warming spices such as cardamom, cinnamon, cloves, and black pepper. They’re lovely simply dusted in confectioners’ sugar, but this year I’ll be brushing them with a rum glaze that adults will swoon for (though not-so-kid-friendly) and dipping some in dark chocolate. Whip up a batch or two and divide them up to glaze, dust and dip! Heat honey, molasses, and butter in a small saucepan over medium-low heat. Stir constantly until hot, about 2–3 minutes. Remove from heat and let cool. Once cooled, add eggs and whisk to combine. Put flour, almonds, cinnamon, pepper, cloves, cardamom, and baking powder into a large bowl and stir to combine. Add honey mixture and stir with a wooden spoon until well combined a dough is formed. Cover surface of dough with plastic wrap and refrigerate for 8 hours or overnight. Lightly oil your palms with some of the oil. Form dough into 36 balls, each about 1" wide (the dough will be very sticky, so keep your hands lightly oiled while working). Divide dough balls between baking sheets, keeping them spaced 1" apart. Bake until slightly cracked on top and just firm to the touch, about 15 minutes. Transfer cookies to a wire rack and let cool. Whisk together confectioners' sugar, rum, and 5 tsp. hot water until smooth. Brush cookies with one layer of glaze while the cookies are still warm. Set cookies aside to let cool completely. Pour confectioners’ sugar into a medium bowl. Thoroughly coat each cookie, one or two at a time, until all sides are covered. In a double boiler, bring water to a boil then reduce heat to low (water should not be touching the bottom of the inserted pot). Stir chocolate until melted, taking care to not break the chocolate (if it does break, simply add a bit of boiling water a little at a time and whisk vigorously until smooth again). Dip cookies one by one and set on a wire rack to cool. 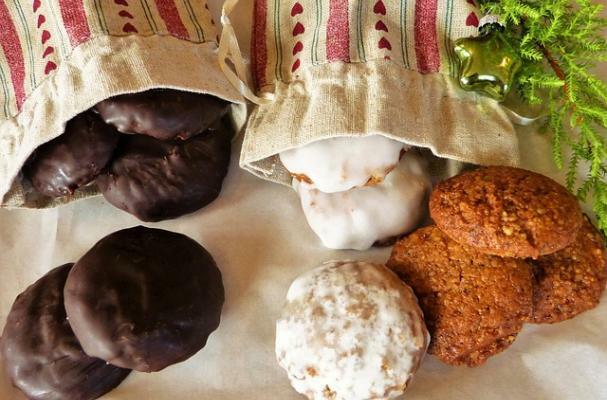 Store cookies in an airtight container, layered between sheets of waxed paper, for up to one week. The 12 Days of Christmas Cookies Countdown!